Following a proposal by members of the British Medical Association (BMA) to introduce GP appointment fees, colleagues and I wrote an open letter to doctors at our local GP surgery. The letter was the subject of an article in the local paper, and is reproduced below. We are writing to you as patients and as students and academics in medicine-related fields to express our concern over recent proposals by members of the BMA to charge a fee for GP appointments. The proposals to be voted on at the local medical committee conference later this month would fundamentally violate two of the three core founding principles of the NHS – that it be free at the point of delivery and that it be based on clinical need, not ability to pay. We strongly urge you to publicly oppose any introduction of fees for access to NHS services and would appreciate your reassurance that you will do what you can to convince your colleagues to do the same. Update (2014-07-14): Apologies for the delayed update. 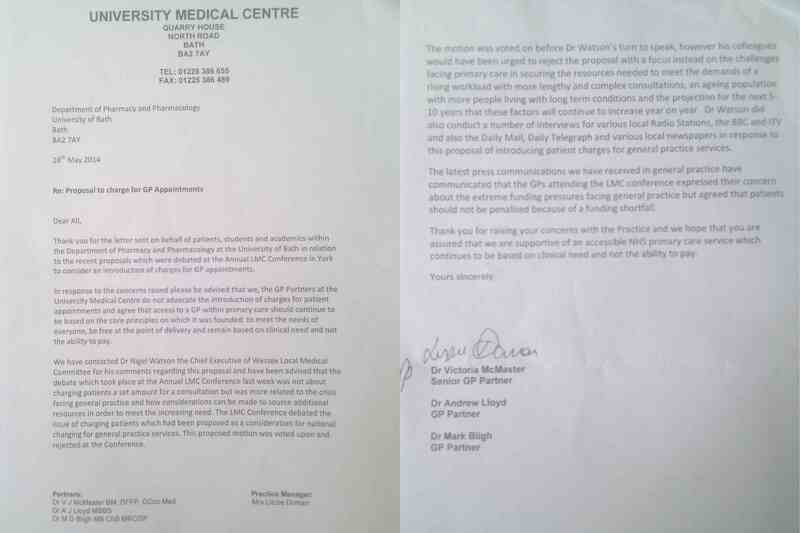 The partners of the University Medical Centre replied at the end of May to confirm that they agreed “that access to a GP within primary care should continue to be based on the core principles on which [the NHS] was founded: to meet the needs of everyone, be free at the point of delivery and remain based on clinical need and not the ability to pay”. They also informed us that they had contacted the Chief Executive of Wessex Local Medical Committee, who informed them that he intended to speak against the proposal to introduce fees for GP appointments, but that the vote was held before he had an opportunity to speak. In any case, I was relieved to hear that the proposal was rejected by the majority of Conference delegates. Workers at the Ritzy cinema in Brixton have mounted a strong campaign to get a living wage from their employer. The owner of the cinema, Picturehouse, owns a chain of others around the country, including the Little Theatre in Bath. The director Ken Loach has expressed his support for the workers at the Ritzy, and as a result Picturehouse have refused to host his latest film at Bath’s Little Theatre. I have already sent a short email to the Little Theatre expressing disappointment at this behaviour and would encourage you to do the same if you have a spare minute. I’ve lived in Bath for around ten years and have always been a regular at the Little. This story (http://www.bathchronicle.co.uk/Ken-Loach-s-sadness-Bath-s-Little-Theatre-owners/story-21115486-detail/story.html) saddened me greatly and it is with a heavy heart that I must pledge to not step foot in the cinema again until the Picturehouse staff at the Ritzy are paid a living wage as they reasonably demand. Should your own staff start a campaign to also earn a living wage I will of course come to stand in solidarity with them as will many of my colleagues.